In the Greek Orthodox calendar there is no official feast day for St. Isaac the Syrian. Traditionally, however, he has been celebrated on January 28th together with the other great Syriac Father of the Church, St. Ephraim the Syrian. The Slavic Churches celebrate St. Isaac officially on January 28th. Not too many years ago Elder Paisios (+1993) sought to change this fact due to his great veneration for St. Isaac. He commissioned a Service to be written in his honor and chose to celebrate his feast on September 28th. The Service was written by the eminent hymnographer Fr. Gerasimos Mikragiannanites (+ 2002). Today the feast of St. Isaac is celebrated on Mount Athos on September 28th. Furthermore, the first church dedicated to St. Isaac was built on Mount Athos, in the cell of a monk of the brotherhood of Elder Paisios in Kapsala. 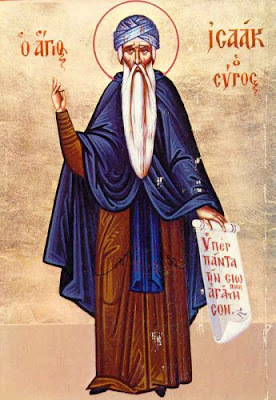 Elder Paisios, who would read the Ascetical Homilies of St. Isaac beneath the icon of the Saint, would say of St. Isaac: "If anyone went to a psychiatric hospital and read to the patients Abba Isaac, all those who believed in God would get well, because they would recognize the deeper meaning of life." "First you must read the Gerontikon, Philotheos History, and Evergetinos. All these books are practical not theoretical. Their simple patristic spirit and holiness will help you remove secular logic from your mind. Next, you should read Abba Isaac, and this way you will not see him as a philosopher, but as a man illumined by God." It should also be noted that before the establishment of September 28th as the feast of St. Isaac by Elder Paisios, when he heard rumors that scholars accused St. Isaac of being a Nestorian, he prayed about this situation. Through divine revelation it was revealed to him that in fact St. Isaac was Orthodox and he wrote in his Menaion for January 28th the following words after the description of the feast of St. Ephraim the Syrian: "...and Isaac the Great Hesychast and much unjustly accused." Below is the text of the Service in honor of St. Isaac commissioned by Elder Paisios. It is distributed by the Kalyva of the Resurrection of Christ in Kapsala on Mount Athos, where lived Fr. Isaac of Lebanon, a spiritual child of Elder Paisios. His ascetical tradition is maintained by Fr. Euthymios and his brotherhood.